Stockton, California, is an awesome spot for railfanning. At one time it was served by Southern Pacific, Santa Fe, Western Pacific, Union Pacific and a host of other railroad companies. Some of those railroads no longer exist, but the maze of tracks they laid throughout the Central Valley is still heavily in use by the UP and Burlington Northern Santa Fe. 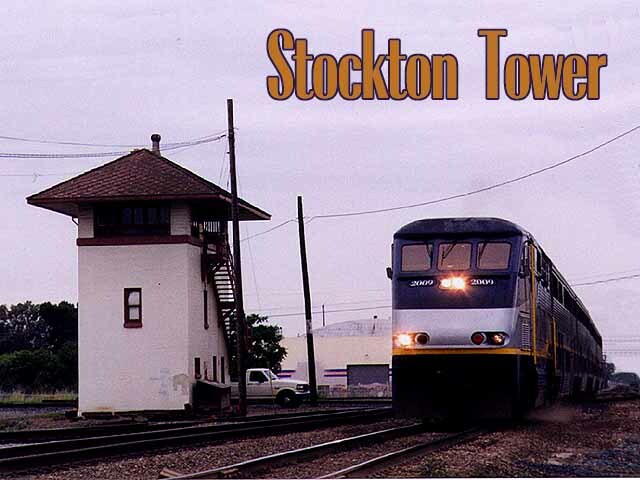 At the center of all the action is Stockton Tower, where the north/south UP tracks cross the west/east BNSF tracks. Upwards of 50 trains pass this point daily. Some of those westbound trains eventually reach our home at Milepost 1147.2. The interlocking tower closed in February 1999 and was slated for demolition, but the area continues to be a good spot to see many trains within a short period of time. 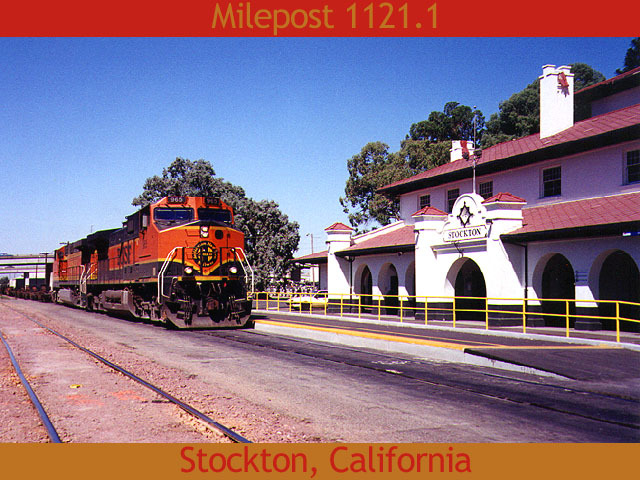 We have made several visits to Stockton since the start of 1998, checking out the Tower, the Amtrak station and the nearby rail yards. We highly recommend it for anyone interested in seeing a lot of rail action. For a more detailed look at this area, we recommend you check out David Epling's Central California Rails site or John Manter's Stockton Tower site listed on our links page. 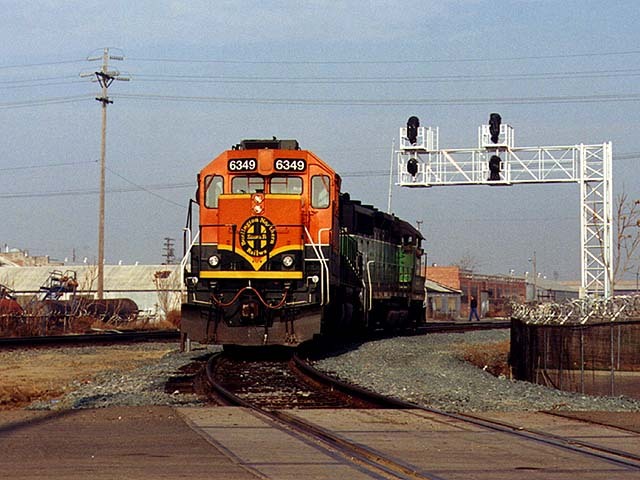 BNSF 960 heads up an eastbound baretable train as it rolls by the former Santa Fe depot in August 1998. This photo accompanied an article Glenn wrote on railfanning at the depot that appeared in the Contra Costa Times. Photo by Roni Gehlke. 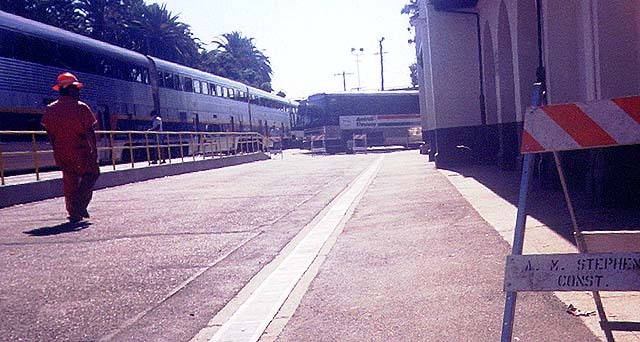 It is a quiet Saturday morning in August 1998 at the former Santa Fe depot on San Joaquin Street, now one of the stops along Amtrak California's San Joaquin passenger route. This view is facing west from the street. If you open the accompanying jpeg file, you can see the peeling Santa Fe logo on the door. If you look inside you can still see remnants of the days not so many years ago when the building served as one of the railway's offices. The architecture of this century-old building is distinctive and hard for a photographer to resist. Photo by Roni Gehlke. A plaque near the depot provides information on its history. 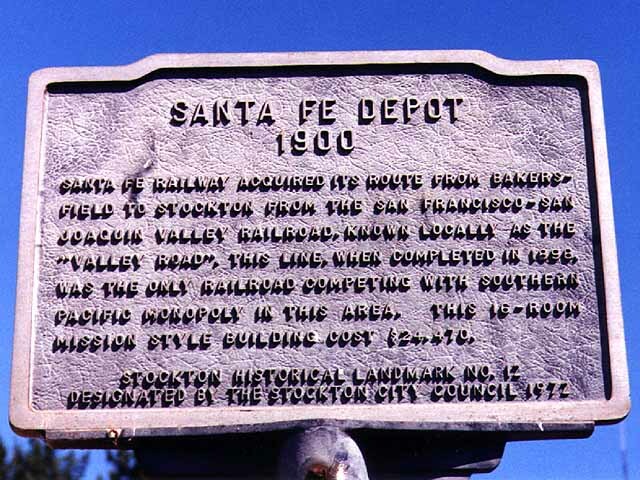 We suggest you download the larger jpeg file for a better look at the words, but basically what it says is that the Santa Fe came to Stockton in 1898 and busted up the monopoly Southern Pacific had over rail traffic in the Central Valley. The depot was built in 1900 for the astoundingly cheap cost of $24,470. Photo by Glenn Gehlke. 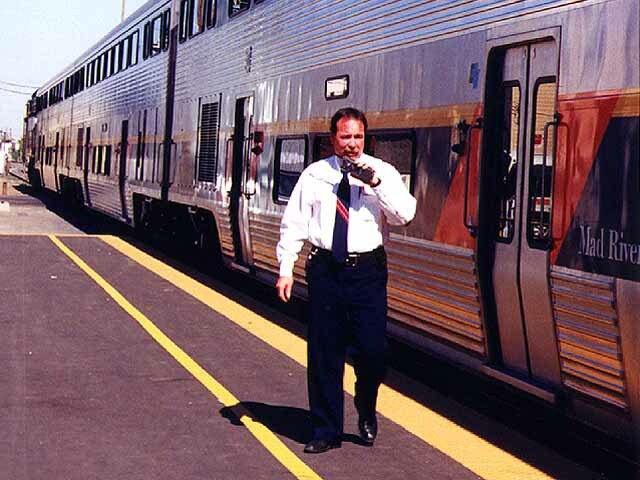 The conductor on Amtrak's Train 716, an eastbound San Joaquin, communicates via radio with the engineer as he does a final check of the station platform prior to the train's departure from Stockton. This shot was taken in August 1998. Photo by Roni Gehlke. 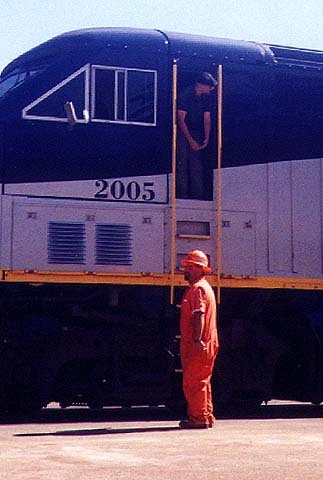 Checking down the platform as he waits for the conductor to give the all-clear signal, the engineer of Amtrak 2005 converses with a maintenance of way worker. Photo by Benjamin Gehlke. The same worker pictured in photo #5 above takes a leisurely stroll along the plaza in front of the Amtrak depot. Crews were in the process of adding a raised passenger platform and improving the nearby passing siding. Photo by Benjamin Gehlke. 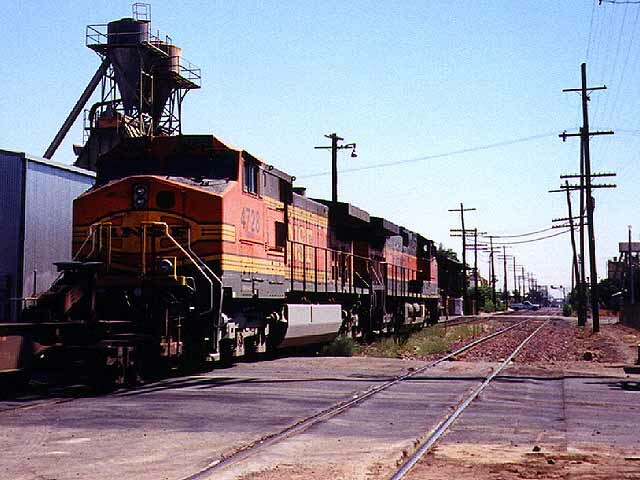 A pair of GE Dash 9-44CWs wearing BNSF's Heritage paint scheme and hauling a string of empty trailer spine cars head east across San Joaquin Street toward Stockton Tower in August 1998. Photographers often complain it is difficult to get good pictures in Stockton because there are too many line poles in the way. We won't argue with that, but what else would you expect from an industrial area? Photo by Roni Gehlke. It is December 28, 1998, and we are taking part in a railfan gathering at the Stockton Tower with close to a dozen other fans. Here, our friend John Manter watches as a UP stack train heads south on the Canyon Subdivision. Photo by Benjamin Gehlke. There's no mistaking where this railfan's loyalties lie. How many folks do you know who drive vans in Santa Fe's Warbonnet paint scheme? Photo by Benjamin Gehlke. The conductor rides behind a pair of light engines as they roll onto the recently installed BNSF crossover track near the Stockton Tower. 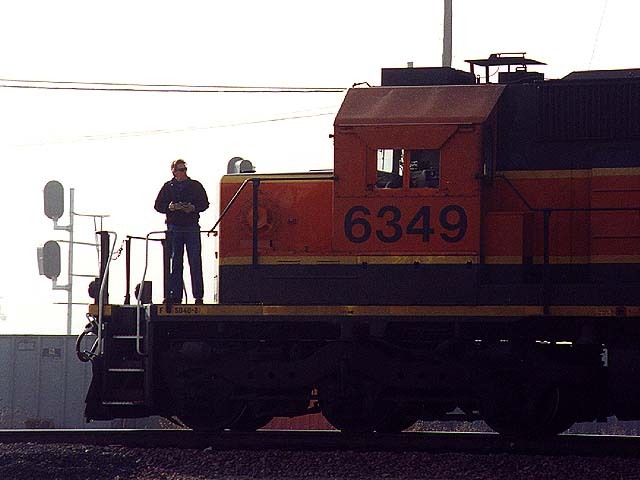 BNSF 6349 is a repainted SD40-2. Photo by Roni Gehlke. 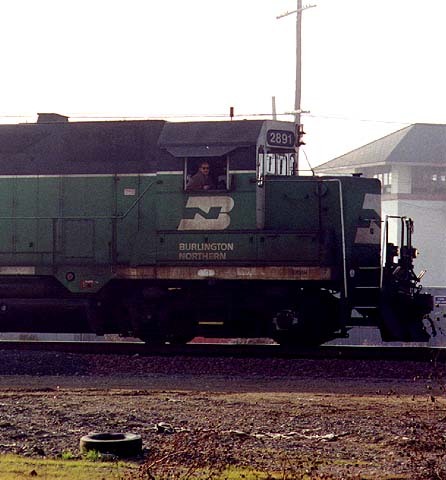 The engineer mugs for our photographer as BN 2891, a GP39M, passes in front of the Stockton Tower. This was the front half of the light power mentioned in #10 above. Photo by Roni Gehlke. The light engines strike the pose as they wait for a green signal before entering the former Southern Pacific mainline. Photo by Roni Gehlke. With F59PHI 2009 on the point, Amtrak Train 714 rolls east past the BNSF Stockton Tower on May 11, 1998. This is one of our postcard series and has been "doctored" in Photoshop to eliminate many of the line poles that would otherwise be visible. We shot this image on our first visit to the Tower during a railfanning trip with David Epling, who made an excellent tour guide. Photo by Roni Gehlke. The engineer of the LMX 8553 gives an enthusiastic wave as his train heads south across the diamond on Union Pacific tracks on its way into the UP yard. The train crews we have encountered around Stockton are generally friendly, but we suspect this vigorous greeting was for the benefit of our 4-year-old son, Benjamin, who was sitting atop dad's shoulders waving just as vigorously. Photo by Roni Gehlke. 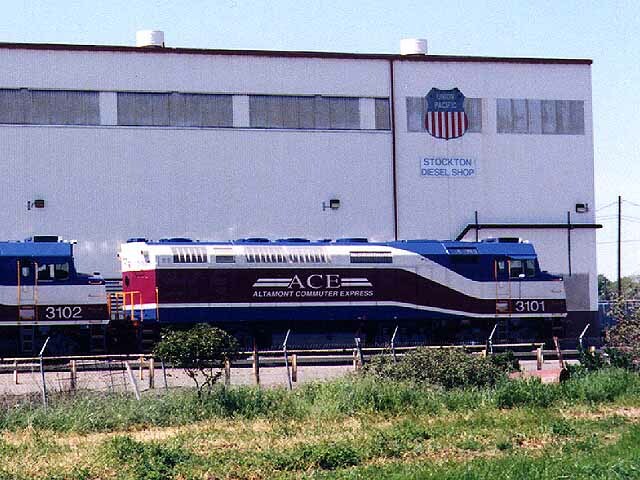 Union Pacific's Stockton Diesel Shops are located south of the Tower and are off limits to the public. However, there are plenty of places outside railroad property where one can photograph the action  or lack thereof. On this visit in March 1998 we spot the new locomotives for the Altamont Commuter Express, which would not see revenue service until Oct. 19. Stockton is the commuter line's home base for its twice-daily weekday trek to Silicon Valley. Photo by Roni Gehlke. 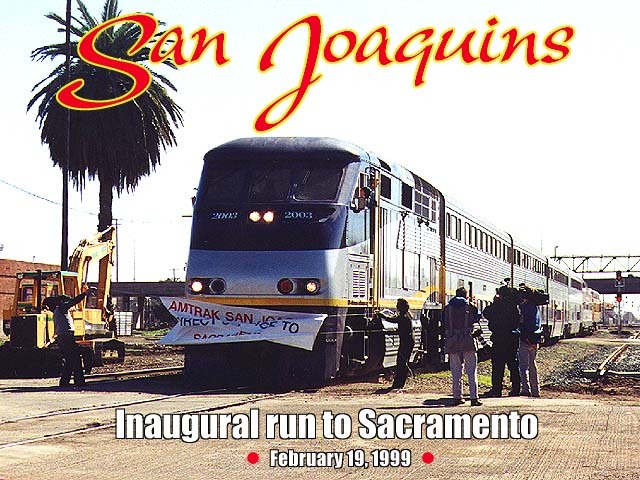 On Feb. 19, 1999, Amtrak resumed direct passenger service between Bakersfield and Sacramento with the introduction of San Joaquin trains 702 and 703. The first day featured a whistle-stop tour from Bakersfield to Sacramento, complete with speeches, media hordes and much fanfare. This postcard depicts the ceremonial banner breaking in Stockton. Photo by Roni Gehlke. There's nothing like the arrival of a special train to get a railfan's blood pumping. Unfortunately, this one chose to arrive before dawn on April 15, 1999. 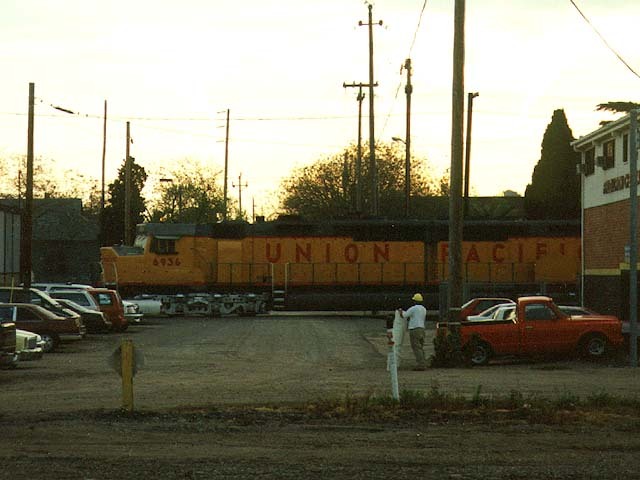 This is Union Pacific 6936, the last DDA40X in operation, pulling an inspection special toward Portola on the former Western Pacific Canyon Subdivision. 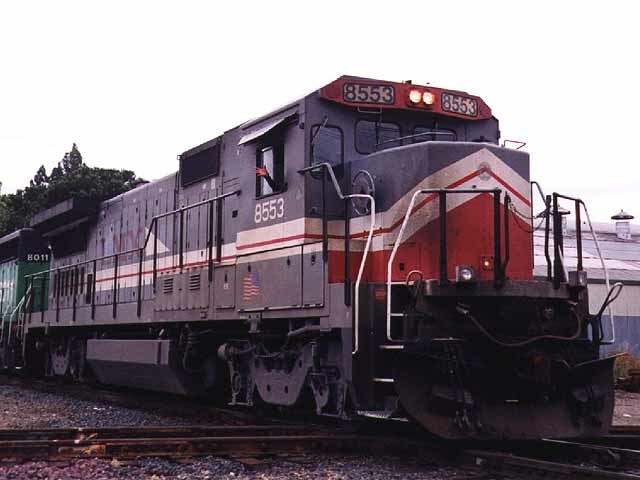 More commonly known as a Centennial locomotive because of its construction in 1969 during the 100th anniversary of completion of the first transcontinental railroad, this mammoth diesel and its now idled brethren are still the largest diesel locomotives ever built. Photo by Glenn Gehlke.